Bucharest’s Old Town is a mix of history, local culture and life style, a trendy entertainment district and favorite hangout for the locals. 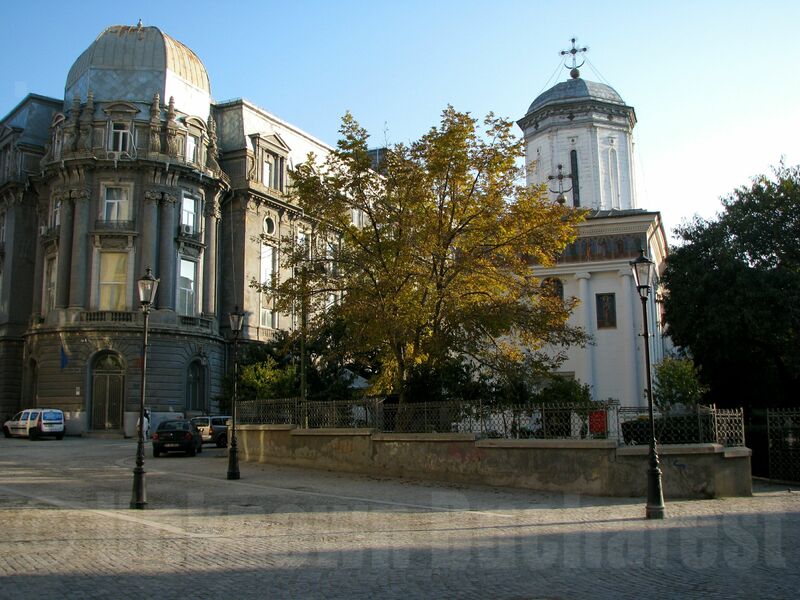 Take one of my Bucharest city tours Walking Tour Downtown Bucharest or Full Day Sightseeing & Walking Bucharest Tour and explore the Old Town with me. Learn the stories of the Old Town and get tips about the best restaurants, wine bars, hidden fashion boutiques and trendy spots. 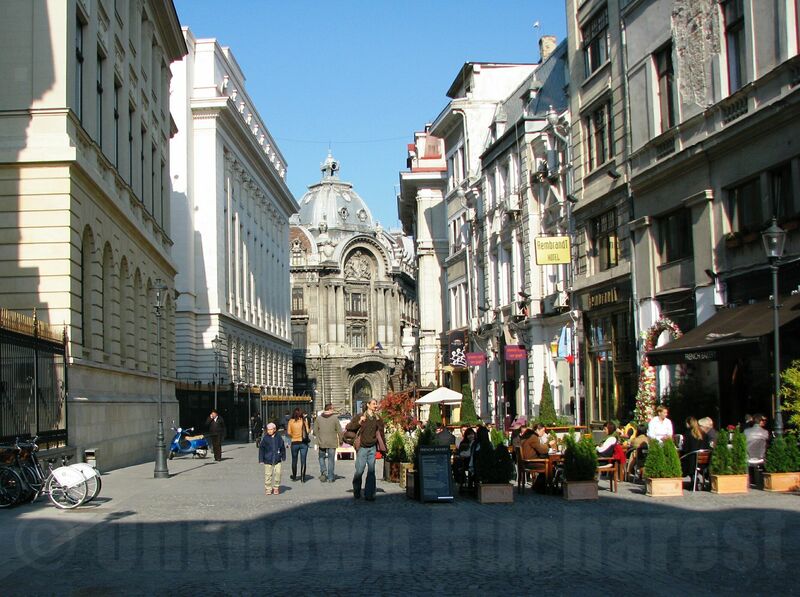 After decades of neglect, major infrastructure renovation works have breathed new life into Bucharest’s Old Town. Many of its superb period buildings have been refurbished or restored, while others, whose beauty contrasts sharply with their state of degradation, are still waiting for their time. Nevertheless, the historic architecture, the old churches, the outdoor terraces and cafés and the romantic feel make the Old Town a most enticing area of the city. The Old Town is the old district of artisans and merchants that emerged around the Princely Court, back in the 16th century. The first Lipscani Lane, paved with wood, has recently been discovered at a depth of 3.30 meters below the current street level. Many of the streets are still named after the various craft guilds of the time, such as Blanari (“Furriers”), Selari (“Saddlers”) or Bacani (“Grocers”). The trade center was in its hay days a bustling, colorful Balkan place, with merchants shouting out loud, praising their wares and trying to attract customers. Earthquakes and fires have affected the area several times, culminating in the catastrophic Great Fire of 1847, and this explains why most buildings that are still standing today only date back to the mid-19th century. Each time, the old neighbourhood recovered and grew even more prosperous than before, as is now hopefully happening once again. A good starting point for visiting the area is the small Square next to the Old Court Church where some of the Old Town landmarks lie. Unfortunately, except for a few 17th and 18th century walls and vaults, there is not much left to see of the Princely Court, which housed the Wallachian Princes for 400 years. The Court, which included the palace, the church, princely chancelleries, reception halls and famous gardens, stretched over a much larger area. After being repeatedly enlarged, modified and fortified, the Princely Palace was abandoned and fell into ruin, before being divided into plots and auctioned in 1798. Some of the buildings in its immediate vicinity later rose on its very foundations. One of such buildings is Hanul lui Manuc (Manuc’s Inn), dating back to 1808. Its open and inviting appearance differs from other inns of the time, which were usually more austere, fortresses-like. Of note is the glazed veranda (“geamlac”, Turkish “camlic”) above the entry gate, an architectural element common to the Balkan-Ottoman influence area. The remarkable double arched gallery on wooden pillars surrounding the inner courtyard is inspired by the old Wallachian style, an extremely rare vestige of vernacular architecture in Bucharest. 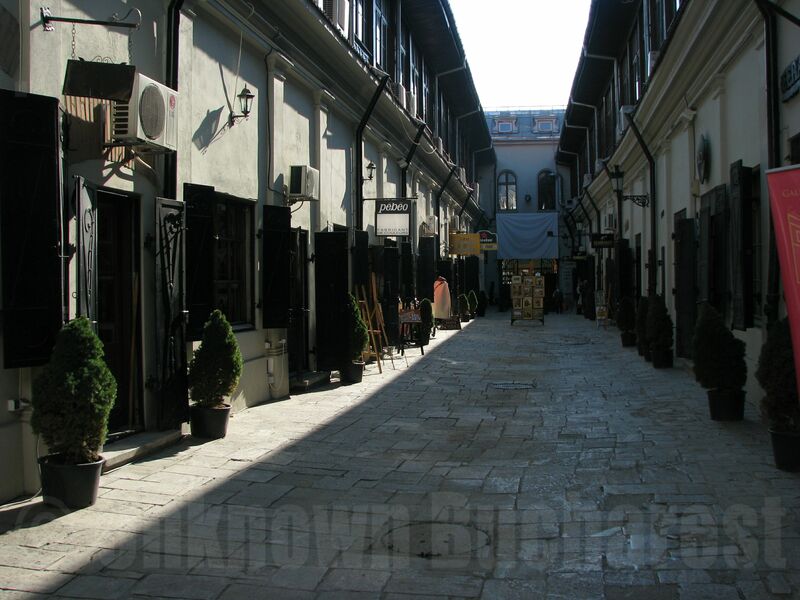 In its large courtyard and galleries one can imagine tilt carts and the “mixture of costumes, merchants arrived from everywhere, townspeople, clergy, peasants and gypsies, all moving around, talking, negotiating, dealing, arguing” (see a picture of Manuc’s Inn from 1841). Manuc’s Inn, considered the last caravanserai of the South-Eastern Europe, was recently restored and reopened. Hanul cu Tei (“The Linden Inn”), built in 1833, is a passage between the streets of Lipscani and Blanari, wide enough to let pass a cart. The Linden Inn had a lucky fate: miraculously spared by the Great Fire of 1847, the Inn was carefully restored in the 1970s and preserves intact the atmosphere of early 19th century. Inside its tiny shops with iron shutters one can find beautiful art and antiquities galleries, painting materials stores and a cellar bar. After a lengthy journey through various locations in Bucharest, The She-Wolf has returned to its original site, the small square at the entrance to Lipscani. 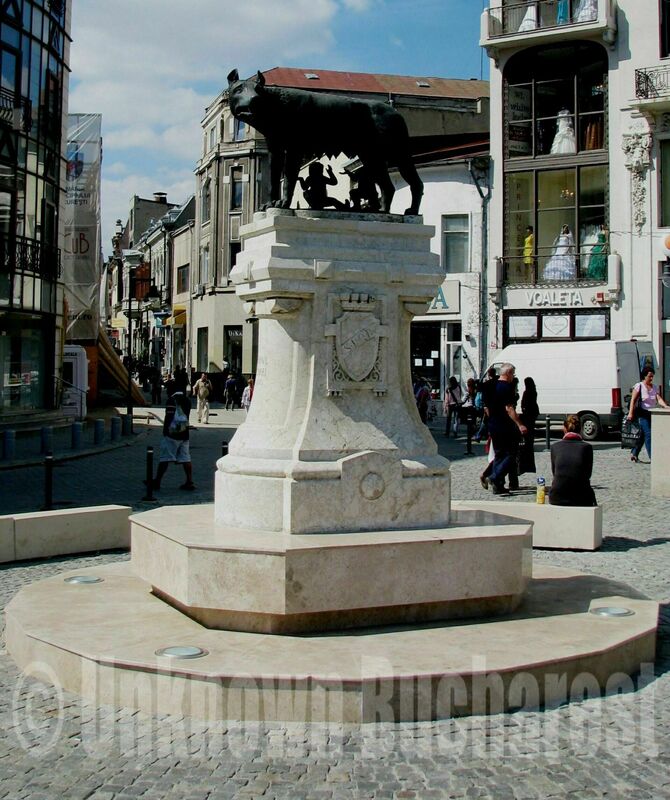 The statue was a gift from the city of Rome to Bucharest, in 1906, on the occasion of 40 years of King Carol I’s reign. On the statue’s pedestal one can see the royalty era emblem of Bucharest, one of the finest in the city: St Demetrius on the shield, the protector saint of the city of Bucharest. The entire area beneath the Old Town is teeming with deep basements and cellars of former inns, shops and boyar houses, as well as communicating networks of hiding places and refuge passages from the Princely Court. Part of former Serban Voda Inn’s vaulted caves have been uncovered in front of the National Bank Palace on Lipscani Street.